Automotive Defense Specialists is a team of hard-working attorneys defending SMOG stations, technicians, and participants in California's STAR Program against actions by the Bureau of Automotive Repair. The law firm is announcing a new post on fighting the Bureau in defense of one's rights. We see our first duty as to fight for the rights of SMOG shops and technicians who participate in the STAR Program. Automotive Defense Specialists, a team of lawyers defending SMOG shops, STAR Program participants, and technicians against California's Bureau of Automotive Repair at https://automotivedefense.com/, is announcing a new post on how to fight the Bureau. Many station owners and technicians are, unfortunately, intimidated by the high-paid lawyers who work for the state of California. Unfortunately, they may therefore not seek out legal representation to aggressively defend their rights under the law. "We see our first duty as to fight for the rights of SMOG shops and technicians who participate in the STAR Program, are threatened with invalidations, and work to keep them serving the people of California," explained attorney William Ferreira of Automotive Defense Specialists. "Our new post explains in layperson's language the steps necessary to fight the Bureau and defend one's rights." To read the new post, visit https://automotivedefense.com/2018/12/07/time-to-give-thanks-for-a-top-defense-lawyer-ready-to-fight-against-the-bureau-of-automotive-repair/. Importantly, the post has a key link to a web page that explains the services offered by the law firm at https://automotivedefense.com/about/services/. Persons or Repair Shops who may be concerned about their licensing status vis-a-vis California's Bureau of Automotive Repair are urged not only to visit the website but also to contact the law firm for a consultation. No two situations are alike, and only competent legal counsel can work with a client, assess the facts, evaluate the law, and determine the best course of action. What is not recommended is "going it alone" against the highly paid and skilled attorneys of the Bureau of Automotive Repair. Here is the background for the release. Every Californian can agree that the people of California have an interest in clean air and that, within the constraints of the law, the State of California and the Bureau of Automotive Repair have a job to do to make sure that every reasonable and lawful effort is undertaken to this end. That said, technicians and repair shop also have rights especially when they are formally or even informally accused of misconduct. Fortunately, the law provides them the opportunity to have legal counsel and support. Many of them may still be intimidated by the attorneys paid by the state, and so the new blog post helps them understand the logistical steps necessary to find a defense attorney and investigate by means of a consultation whether he or she can help them. For these reasons, Automotive Defense Specialists is proud to announce a new post to their blog. 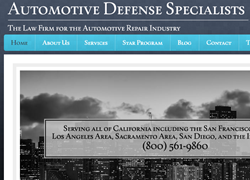 Automotive Defense Specialists is a top law firm representing auto repair facilities, SMOG check stations, and technicians in every facet of their legal needs including Bureau of Automotive Repair letters, citations, and invalidations. The company offers phone consultations to auto shops, mechanics, technicians and others who are facing disciplinary actions from the California Bureau of Automotive Repair.